UMI’s new premium Stage 3.5 kit. No compromises. The stage 3.5 is for the street warrior who just may feel like going out to win an event. This kit is capable of making that a complete success. 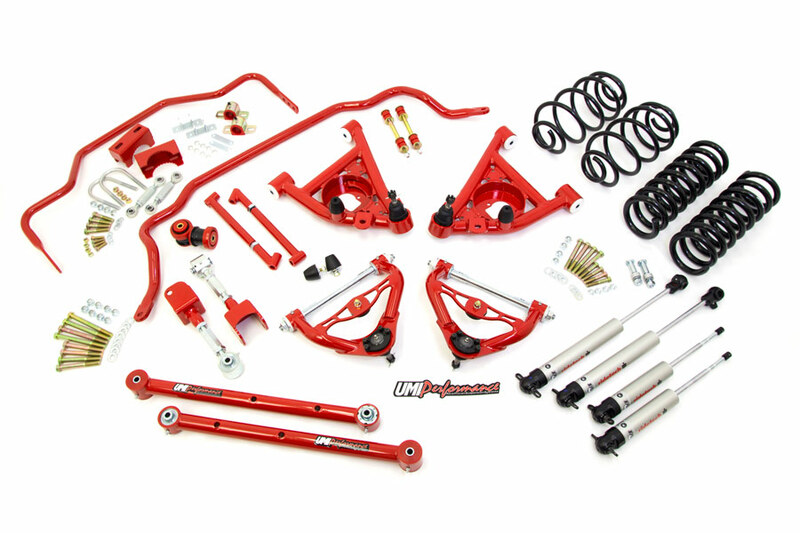 From back road corner carving to auto-x and pro-touring events, this kit has the performance features you desire along with ease of installation and tuning. UMI’s new 1” lowering springs form the handling foundation and are controlled by RideTech’s HQ rebound adjustable shocks. Our ultra-premium springs feature carefully tuned rates and high quality construction to eliminate the floating feeling and will tie your G-body directly to the road. The RideTech HQ shocks rebound adjustment allows you to fine tune your ride whether you’re doing back road heroics or shaving that last tenth of a second between the cones. UMI a-arms feature tubular construction, Delrin bushings for precise steering and caster corrected uppers. The ½” taller upper ball joints work with the lowering springs to tune up the factory G-body camber curve. 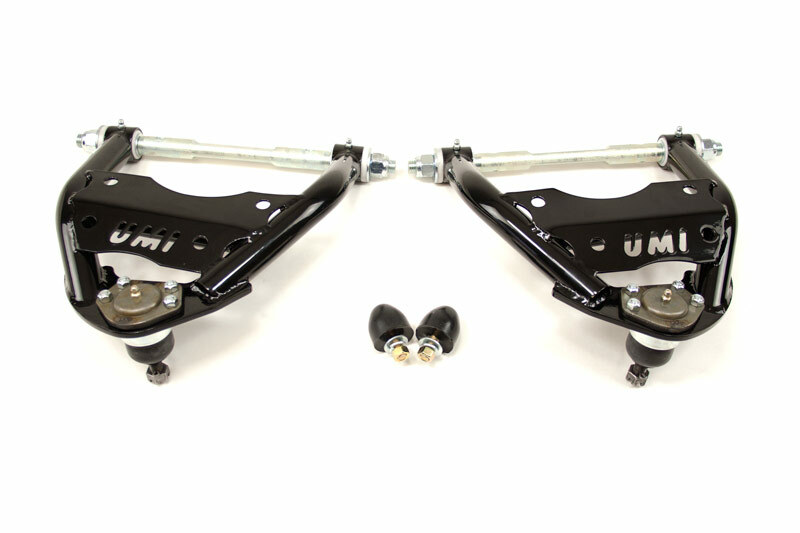 Out back the UMI trailing arms feature Roto-joints for smooth articulation combined with poly bushings for a smooth ride. Adjustable upper rear control arms allow for pinion angle tuning while the new pro-tour bar performs on the street, during cornering and even a drag strip blast. The entire package is designed and manufactured by UMI in Philipsburg, PA – USA of US materials and we’re proud to drive on and race what we build. 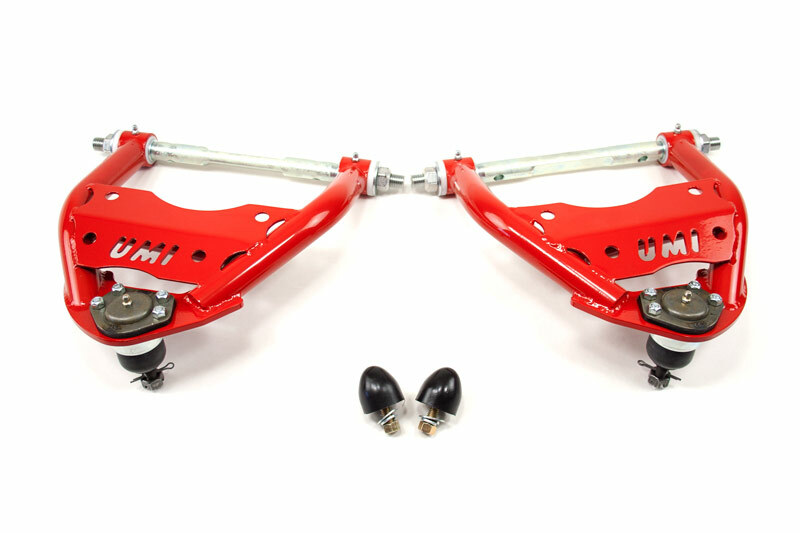 Note: Chassis mounted rear sway bar included fits factory rear end axle tubes measuring 2.750”. If your vehicle is using an aftermarket rear end with larger axle tubes please contact us for 3.000” or 3.250” u-bolts. RideTech HQ shocks feature monotube construction and rebound damping adjustment. Rebound adjustment tuning improves handling and responsiveness. Lowering springs feature ultra premium CrSi material with linear rates front and rear for consistent handling. (530 lb/in front, 130 lb/in rear). 1” diameter rear Pro-Tour sway bar offers tune-able rear roll resistance and less binding for street, corner carving or light drag and is balanced well with our 1.250” front bar and spring rates. #3032 - Tubular lower front a-arms with Delrin bushings. #3033-2 - Tubular upper front a-arms with Delrin bushings & ½” taller ball joints. #3035 - Heavy duty 1-1/4” front sway bar with new bushings & endlinks. #3044-275 - Tubular & adjustable 1” pro-touring rear sway bar. #3050- 1” lowering springs, linear spring rates (530 lb/in front, 130 lb/in rear). #3038- Tubular rear lower control arms with Roto-Joint. #3037- Adjustable rear upper control arms with Roto-Joints. #3028- Tubular frame braces with hardware. #3000- Replacement rear end housing bushings. #3013- Front upper & lower Grade 8 hardware kit. #3001- Rear control arm Grade 8 hardware kit. (4) RideTech HQ shocks, handling quality with rebound adjustment. Big Block Engines- An additional 1/4" front end drop may occur on vehicles with full weight big block engines.